Sometimes we get really cool unique ideas from clients and other times we come up with something unique and our clients catch on and have to have one for themselves too. 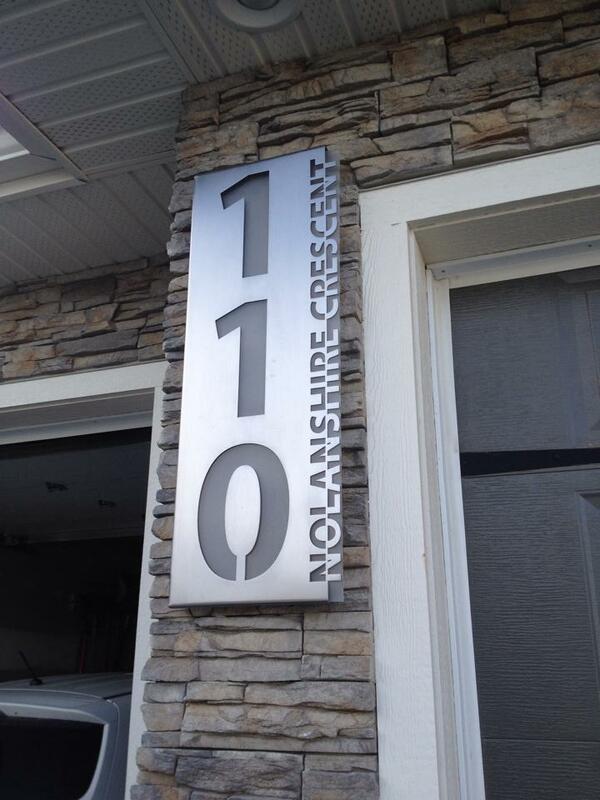 A typical house number sign has the house # and that’s it, and we’ve made plenty of them! However adding the street name without making things look too busy or forced, took a bit of creativity. This is an idea that we’ve come up with and believe us we’ve looked at hundreds upon hundreds of different house number styles out there. There’s nothing like this out there, till now. The text plays on the use of positive and negative space and just has a really unique look to it. 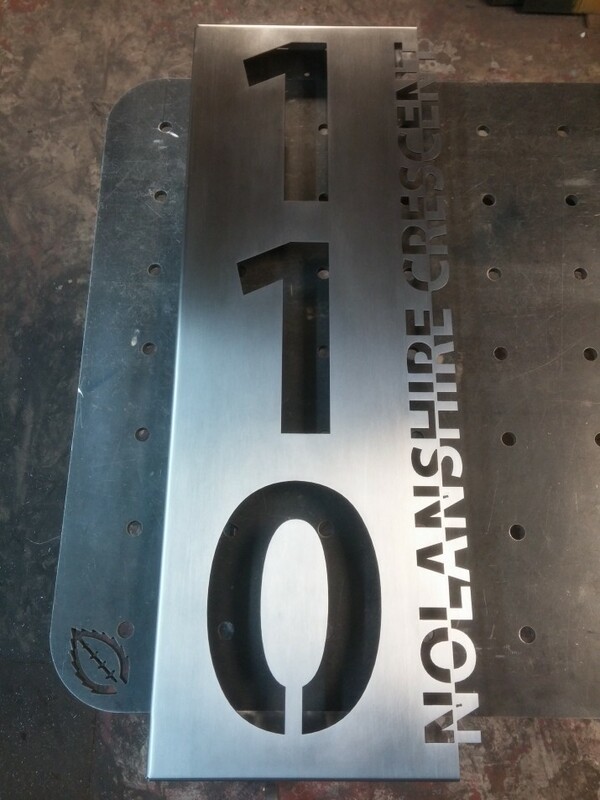 Here is the first house sign cut on the CNC table with this style, 14ga cold rolled steel. Nothing fancy, just something that will be unique and stand out. 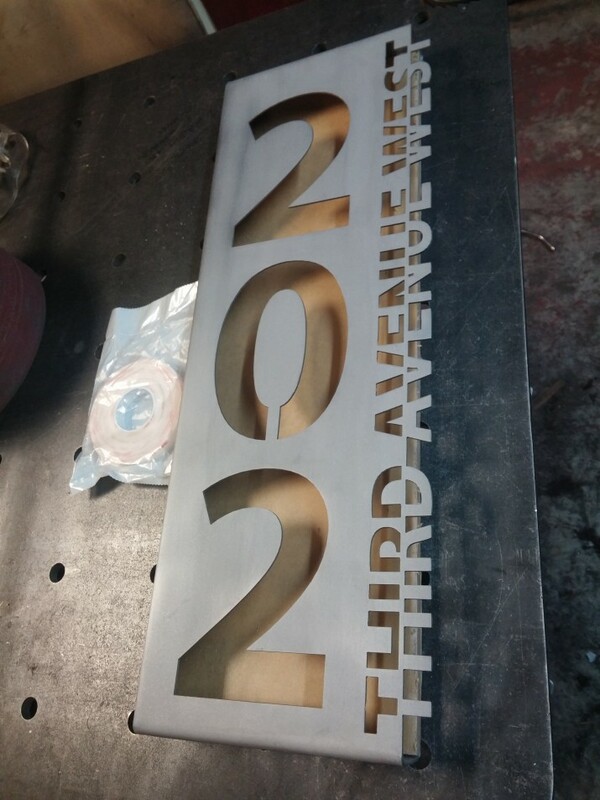 The top holes are to hang the sign, the single bottom hole is for securing it to the wall, the hole is accessed via the bottom of the “2”. The three smaller holes are for drainage in case of any standing water, however looking back on it, they most likely won’t be needed. 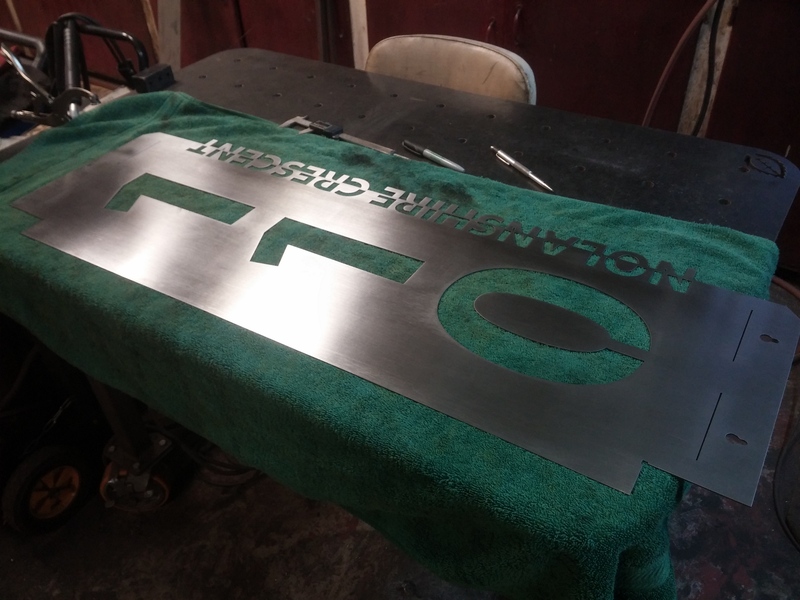 We started another one for a client, this one is considerably bigger and has a bit of a different style to it. 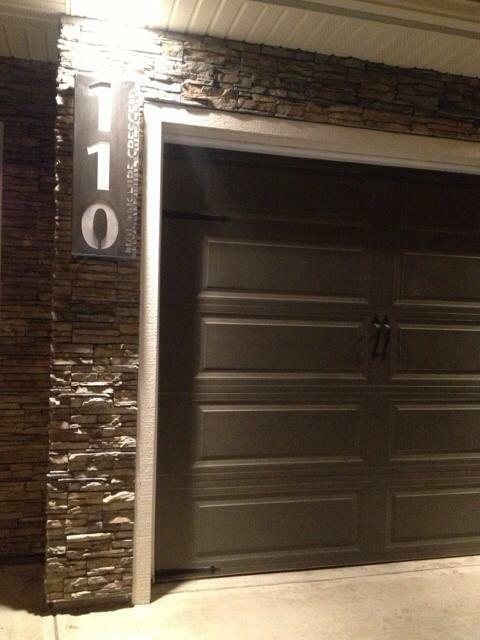 It has the unnecessary drain holes omitted, the hanger and mounting screw had to swap ends due to the “0” not allowing a screw to attach it to the wall like the original sign. The finish of this part was a bit more time consuming as it is too big for us to powder coat and regular paint would be a bit bland. So instead it has a brushed finish with the help of a belt sander, inline sander with 80-120 grit and the use of a medium grit Scotchbrite pad. After prepping the steel it was clear coated and given time to dry. Then it was waxed with a high quality carnauba wax and is ready for the customer to pick up and install! 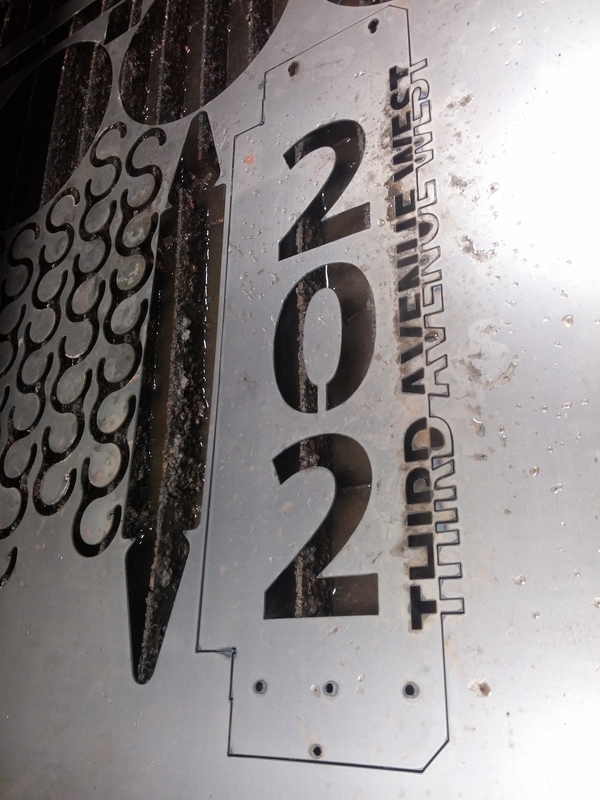 Here’s a time lapse of the metalwork fab portion of this project. And here it installed (photo courtesy of Amanda H.). Thanks for looking! Please take some time to look at our available services and if you have any questions don’t hesitate to contact us via our Contact page. Here’s another project where we’ve built another steel crate used to secure oxygen tanks on the back deck of a truck. It has specific requirements from the customer in terms of loading capacity as well as transportation requirements. 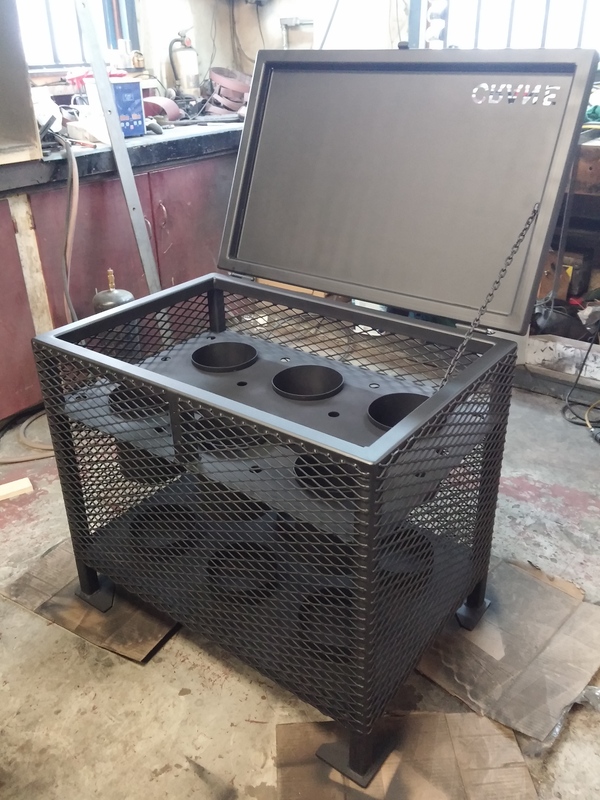 It is using 1.5″ steel tubing, has a 14ga steel top, 10ga steel floor and horizontal support as well as flattened expanded mesh side panels. 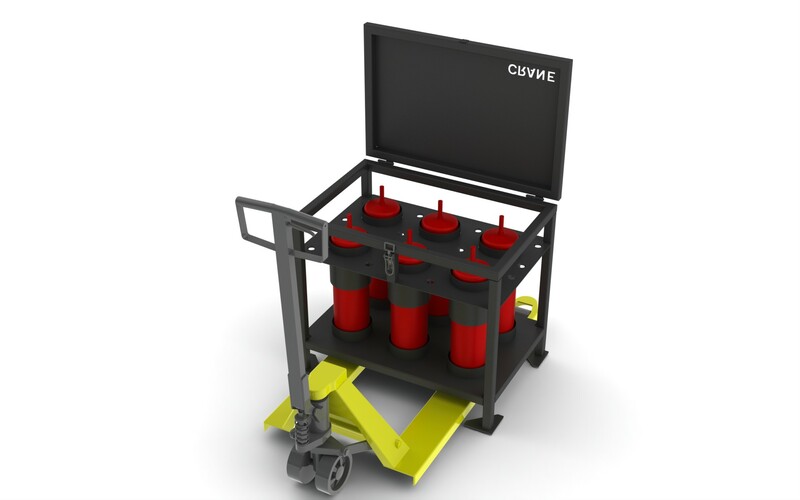 This tank is specifically built to transport oxygen tanks and so there are steel sleeves welded into the horizontal support as well as the floor to keep the tanks steady during transport. This will also allow for easy insertion and removal of the tanks and ensure that no tanks will be loose during transport. This is the approved CAD model (sans mesh, handle and chain limiting strap). Here you can see the frame being welded up. The use of a square (not shown), 3/8″ steel scraps, ratchet strap and clamps are to ensure that everything is square prior to tacking. 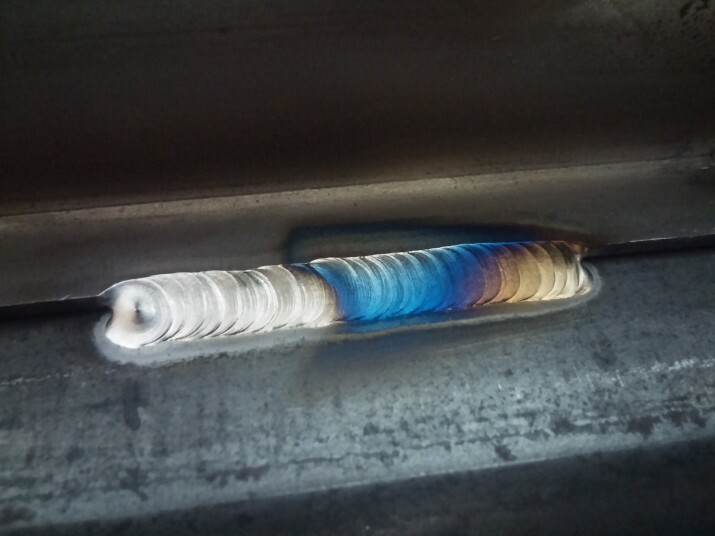 This will keep everything nice and square and ensure it won’t need any tweaking before or after welding. 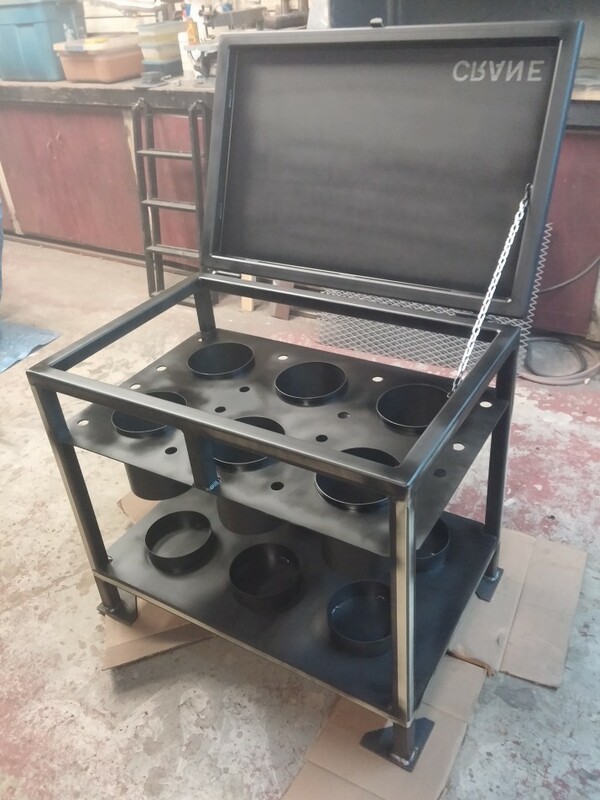 The 14ga cold rolled steel lid welded to the lid frame and mocked up on the crate. 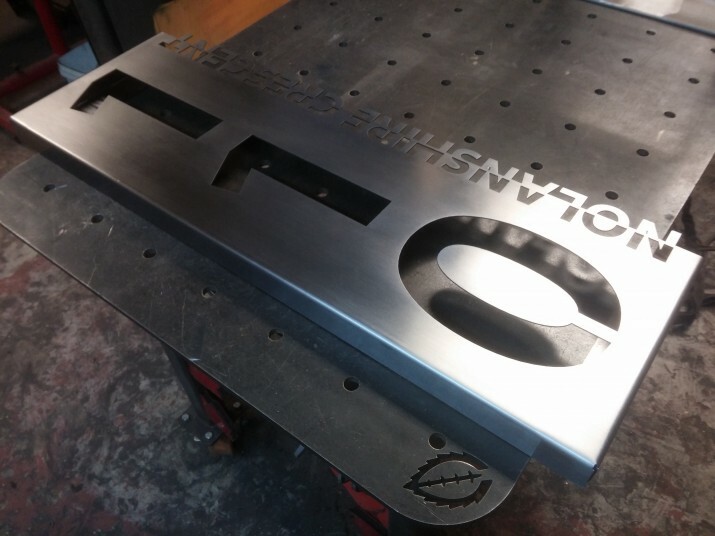 The 14ga sheet was cut on the plasma table, then the edges were formed in the box and pan brake to give it a nice radius edge prior to being welded into the lid frame. Here the floor and horizontal support are cut out from a 4’x4′ sheet of 10ga steel. 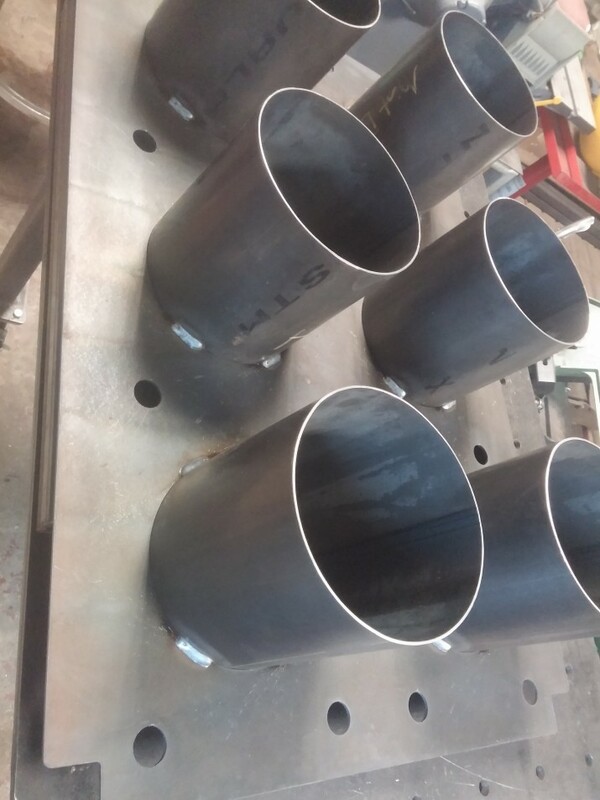 Here we have the steel tubes welded in place on the 10ga horizontal support. Here it is mocked up sitting on top of the crate. 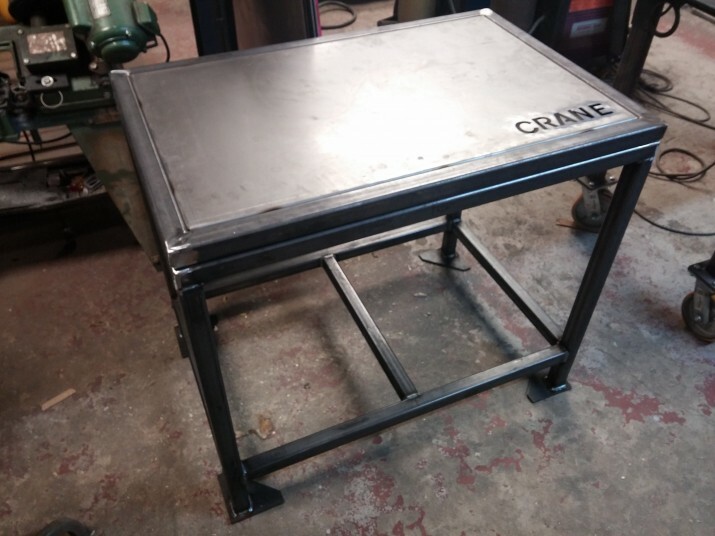 The crate will get flipped upside down and the horizontal support will be blocked the correct distance and then it will be welded into the frame. The smaller holes on the horizontal support are to allow for the optional use of a bungee cord. There is some clearance between the tube and the tank (as seen on the right), and the use of the bungee cord will pull the tank to the side of the tube and eliminate any vibration or noise. Also notice the drain holes in the steel floor, just a small detail, but the last thing we’d want is the tubes on the floor to collect and pool water! 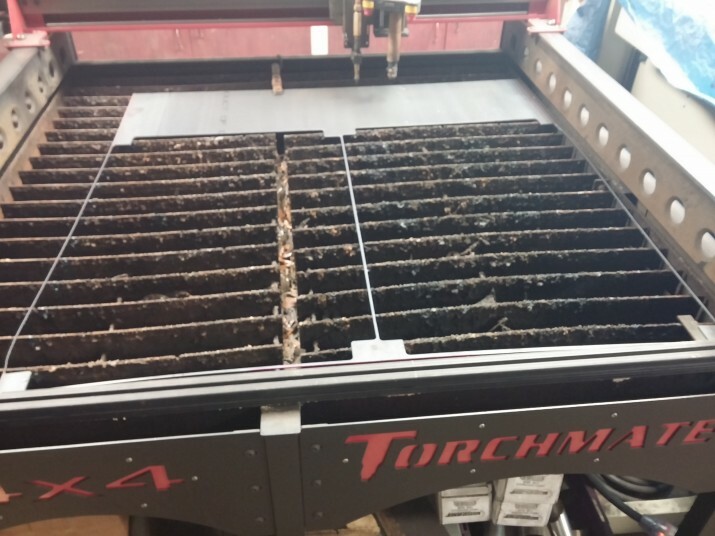 The feet were also CNC cut from 1/4″ steel, they’ll distribute the load of the crate as well as the strapping load across a larger surface on the wood deck of the truck, the pounds per square inch were calculated to meet the customer requirement. Here’s the crate with it’s first coat of paint. Notice the mesh is missing? That’s because you can’t easily paint the inside once the mesh is in place. 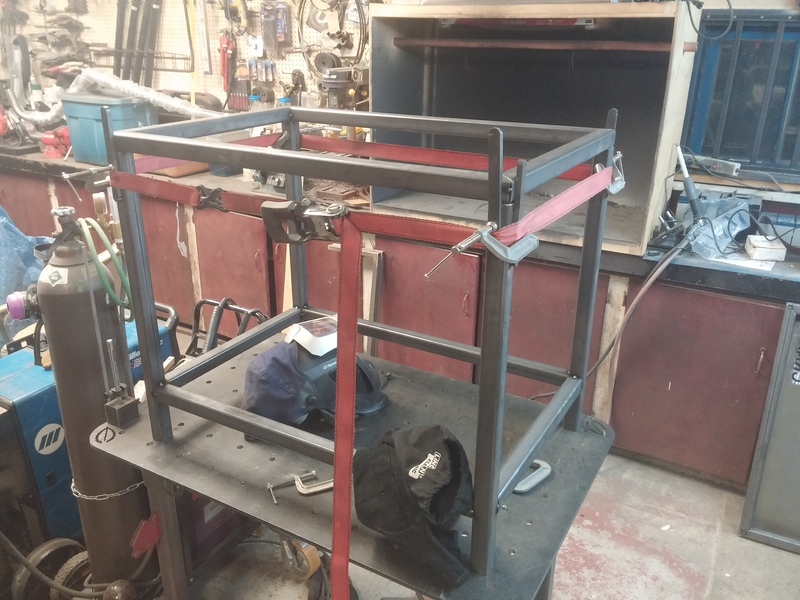 So the inside needed to be painted first, then the mesh welded on and then the entire crate gets another final coat of paint before it’s ready to go. The masking tape is to avoid over spray onto the flat surfaces that the mesh will be welded onto. Here’s the completed crate (sans latch) still drying from paint. Thanks for looking! If you have any questions or a future project you want us to work on, please don’t hesitate to contact us via our Contact page. It’s been a little while since we’ve had a blog post! After a few big transitions and a few more to come we’ve got lots of exciting things in the works to show. So all excuses aside, there will be more blog posts to come about the work that has flowed through Mint over the last while! There have been a few people asking about more detail and video about how the AVHC corner/torch lockout works on our table. So this is a continuation of our AVHC Corner Lockout for Holes blog post. These two video’s show how well the AVHC lockout performs with having the CAM portion setup correctly and that information being fed to the TM4 software and ultimately controlling the CNC plasma table. Long story short the lockout allows the torch to run at 60% the recommended straight line cut speed. The reason for slowing it down is to allow for a straighter hole with less to no taper. Imagine hanging a bat by holding the end with two fingers, the bat is the plasma arc and your hand is the torch. If you move your hand quickly the bat is going to lag behind the movement of your hand. Now do a quick circular motion. You’ll see that the tip of the bat (furthest from your fingers) will naturally want to point to the center of the arc. Now the stiffness of the arc is like changing the weight of the bat, in most cases we can’t change that, but what we can change is how fast our hand or torch moves. So slowing down the movement keeps the tip of the bat lagging behind your hand less. This is the same principle as with the torch and plasma arc, slower movements in area where there are tight arc’s or heavy directional change features that are critical to the function of the part (bolt holes, slots etc…) warrant slowing things down. 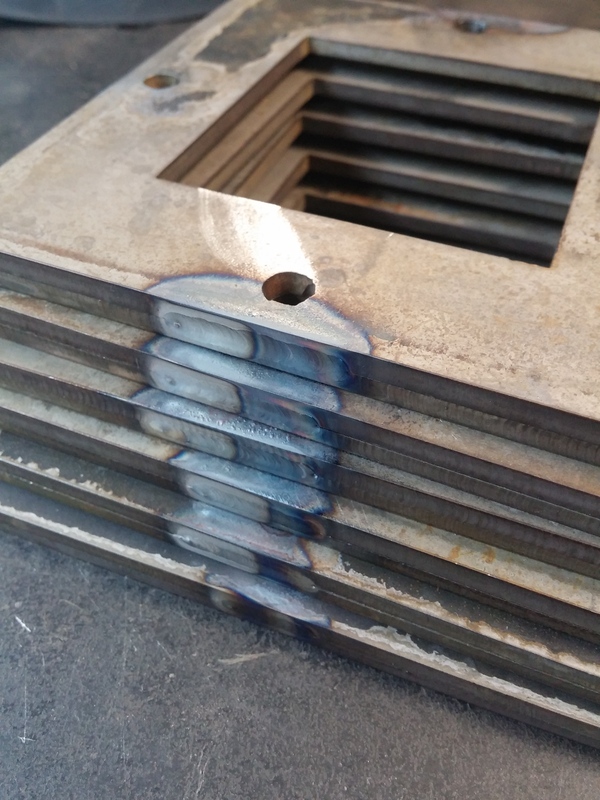 This is why high definition plasma, laser and water jet have very good cut quality, it’s due to the stiffness of the arc or water jet, however at an increased cost. Take a look at our videos and enjoy. 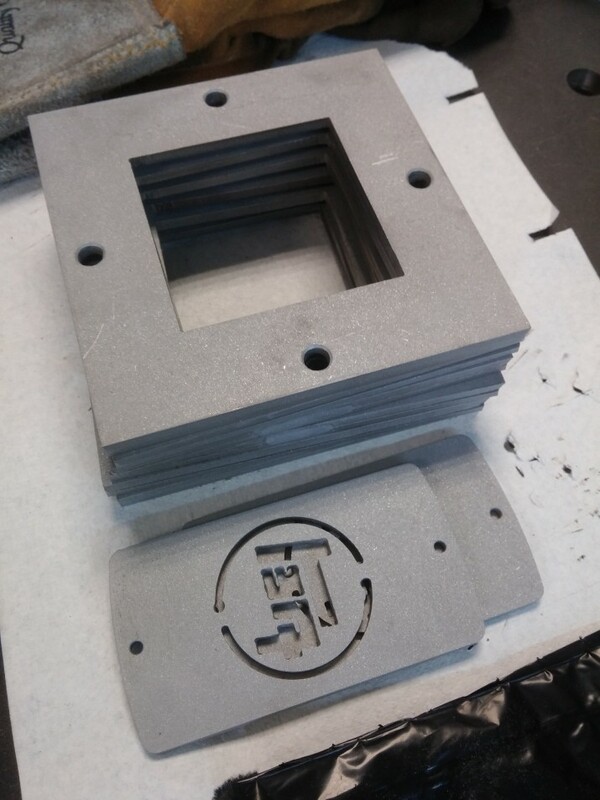 The holes were lightly chamfered, no drilling or grinding of the ID of the hole was necessary. These are all blasted and ready for powder coating. 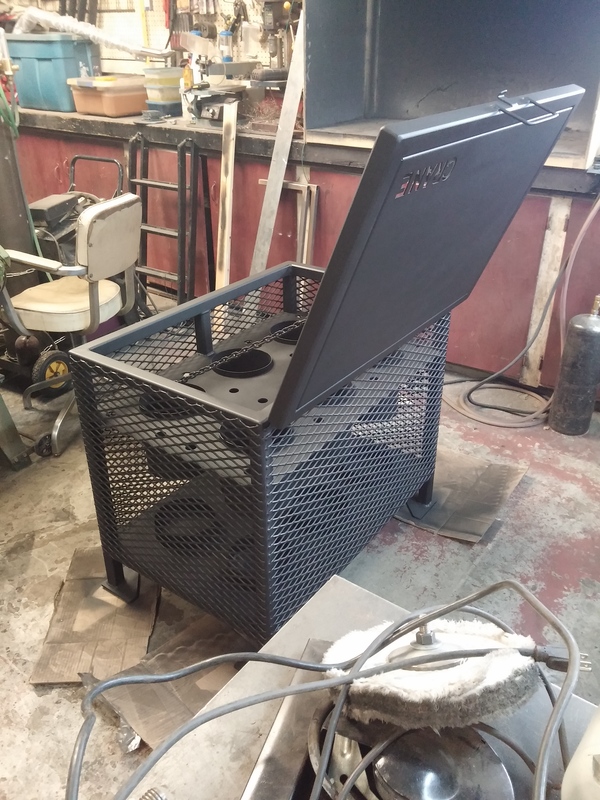 Fresh out of the oven after being powder coated wrinkle black and ready for customer pickup! 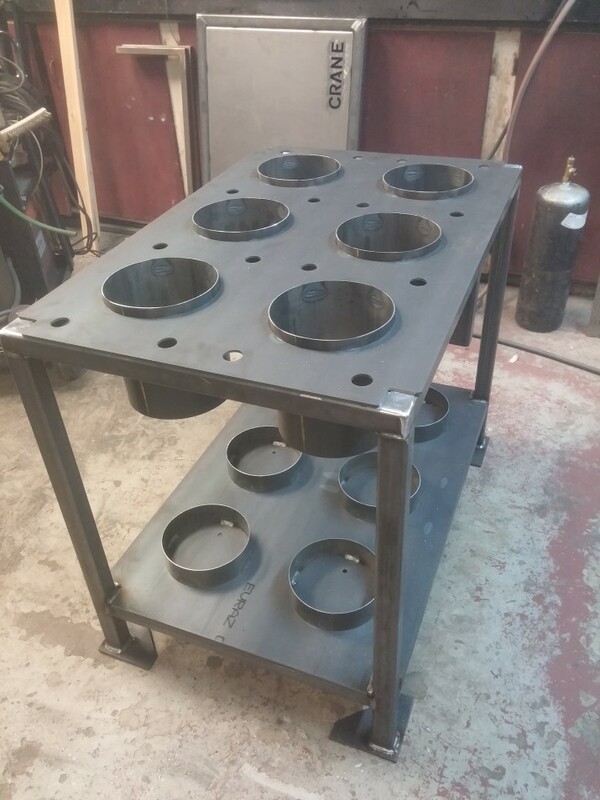 The items on the left will have a glass sheet put inside the part and it will be installed and used as a flame inspection port. 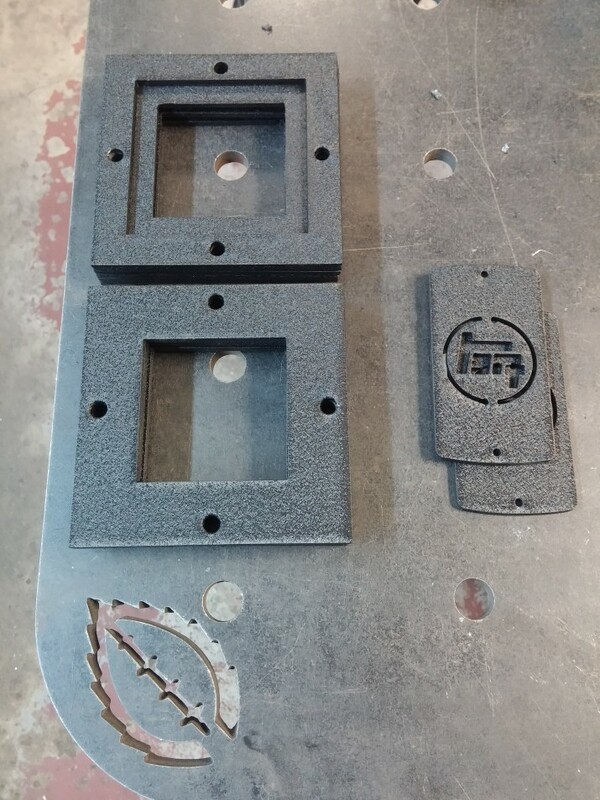 The items on the right are a badge to be installed on an old school Toyota truck. Stay tuned for more blog posts! If you like these posts please subscribe, if you’re interested in a future project, please contact us on our Contact page.